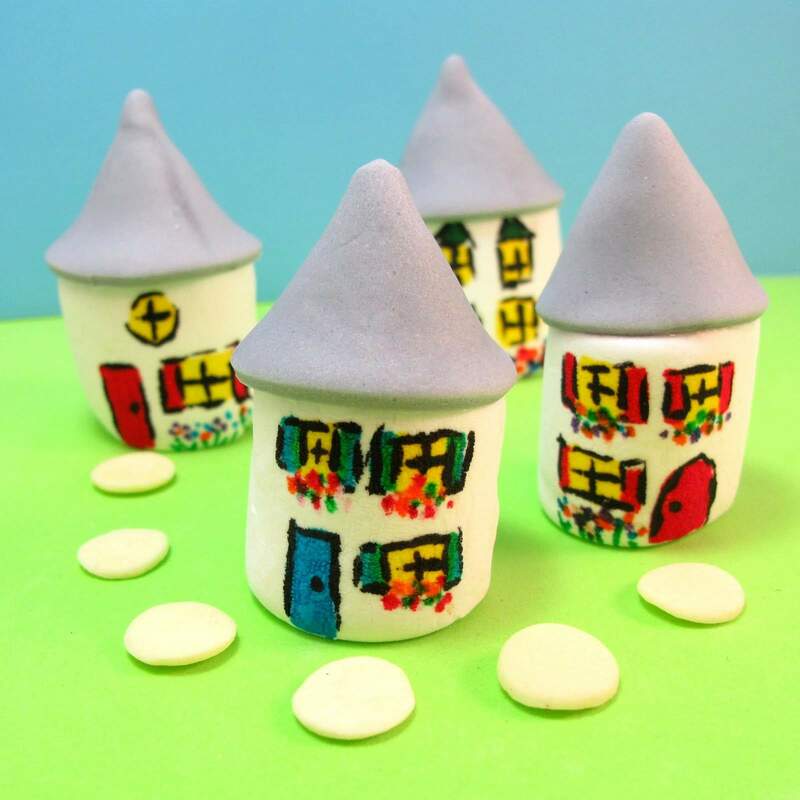 I’m starting to think there is nothing marshmallows can’t become… like these li’l houses turned into a marshmallow village. 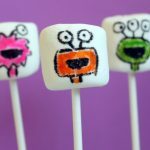 Easy to make, fun to create, and totally edible. For more tips on how to use food writers, click here. *Edible pens are found at craft stores, though I prefer Americolor gourmet writers (harder to find in stores, but more color options and finer tips). 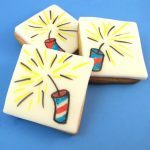 Find fondant and food coloring at the craft store. 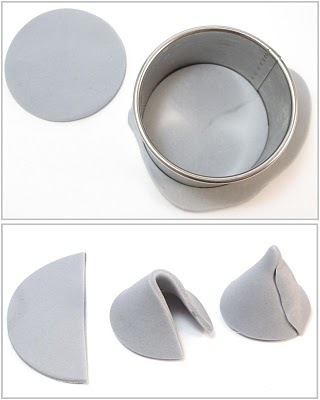 Add one or two drops of black frosting color (to make gray) to a palmful of fondant and knead very well, until fully blended (if fondant gets too sticky from the handling, let sit uncovered at room temperature about 15 minutes to stiffen). Roll gray fondant between two pieces of wax paper thinly, about 1/8 inch. Cut out a circle with the cutter and cut the circle in half. Fold semi-circle into a cone shape and mush edges together to seal. Adjust the cone and the point at the top as needed with your fingers. Set cones aside on wax paper to stiffen about an hour. 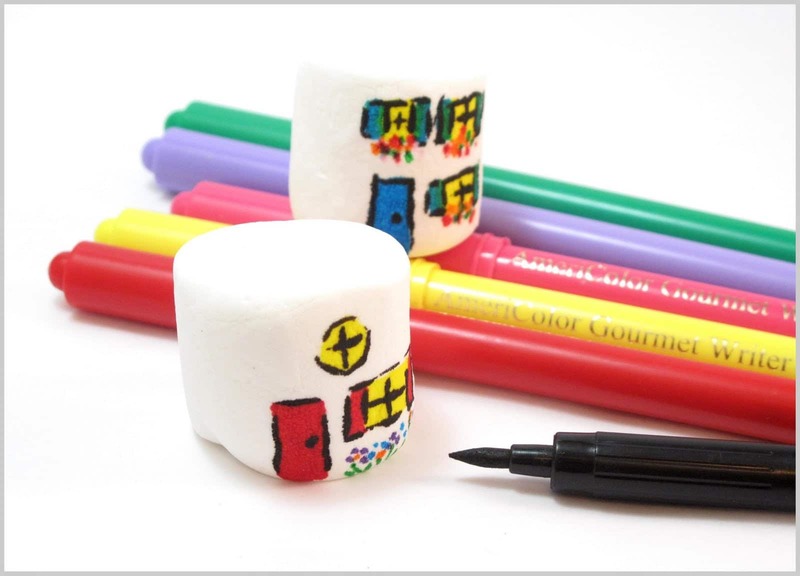 Draw the facade of a house on a marshmallow with the edible pens. Some tips: Let the marshmallow sit uncovered for an hour or so to stiffen a bit on the outside. This isn’t necessary, but helps control any bleeding from the pens. Also, I used the black marker last, to outline the design I made with the other colors, and I was able to get more detail by drawing with the very tips of the pens. 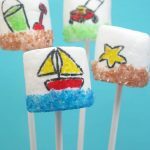 Dab your finger in the corn syrup and rub along the top of the marshmallow at the edges. Gently press cone on top (with the edges that were sealed in the back) and let dry. Too cute! 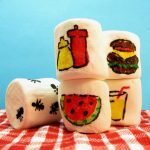 You are so talented – who would have known marshmallows had so much potential!! These are the cutest things ever! SO CLEVER!!! I finally bought the Americolor writers:), so will have to put them to use! These look like a little European village. Love it! OMG!! I LOVE these guys!! They are so cute!! very cute! I love them alot. SOOOO adorable! I love them! It's like Smurf Village but even cuter!!! Love it! 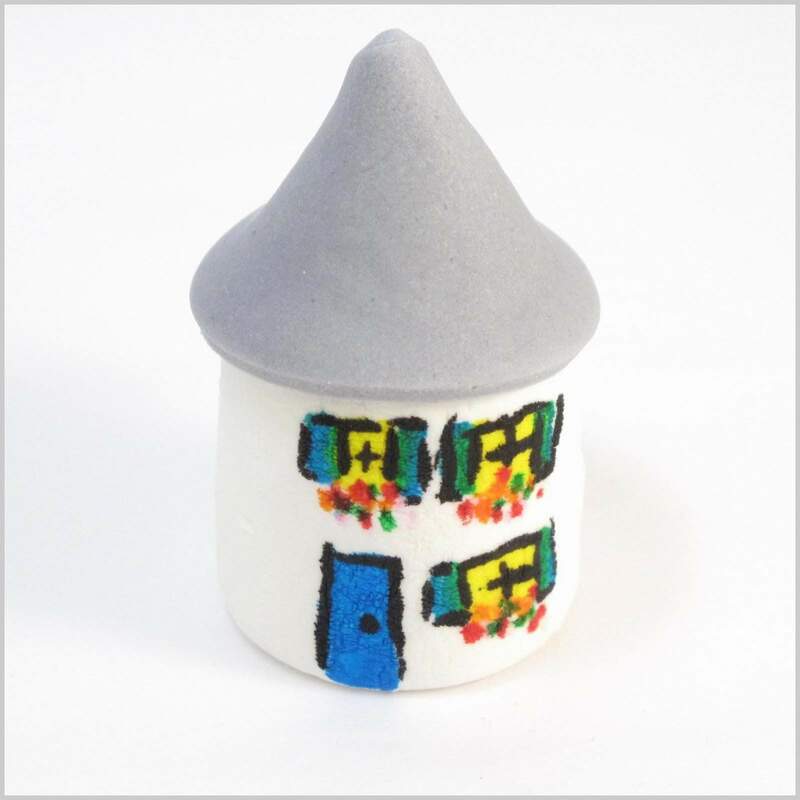 I saw these in Craftzine & thought I'd stop by to say how cute & clever they are! This sounds like a perfect project for when I babysit tomorrow night! I may make a stop at Michael's tomorrow! This is a really nice idea you have here! So adorable and so fantastic!